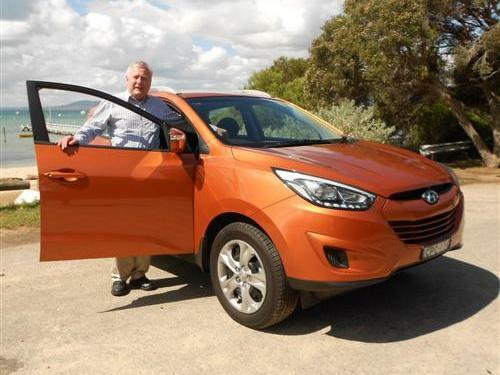 From the company that can, seemingly, do no wrong comes the Hyundai ix35 Series II. 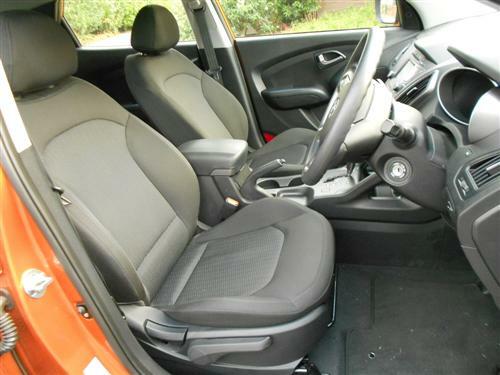 This popular small SUV comes in FWD and AWD, petrol or diesel, manual or automatic, in four trim levels and with a made in Korea or made in Europe tag. Our drive car was the base model fitted with automatic transmission. 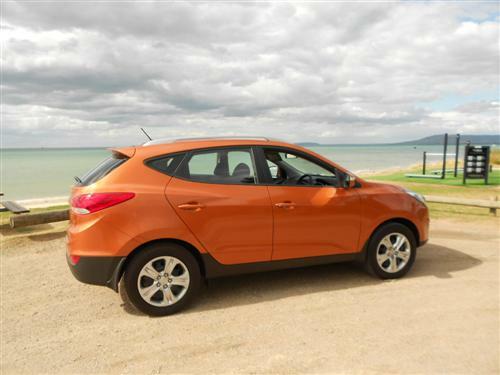 So that's the Korean-made Hyundai ix35 Active, a front-wheel drive petrol-fuelled delight that is priced from $29,190*. 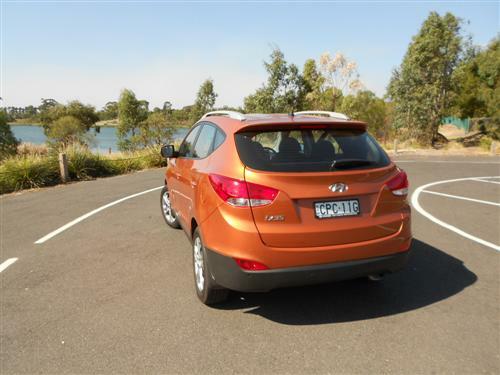 The optional Atomic Orange Mica paintwork adds $495* to the price of an Active, taking the test car price* to $29,685*. Immediately apparent is the rather pleasant roadside manners of the test car. The elevated driving position, often cited for providing improved vision, is one attraction plus the agility in suburbia that is afforded to compact sized vehicles. The driving dynamics were always considered to be at least average for this class of vehicle. Interesting, the small SUV segment of the market is attracting a lot of interest - from buyers and many car makers. 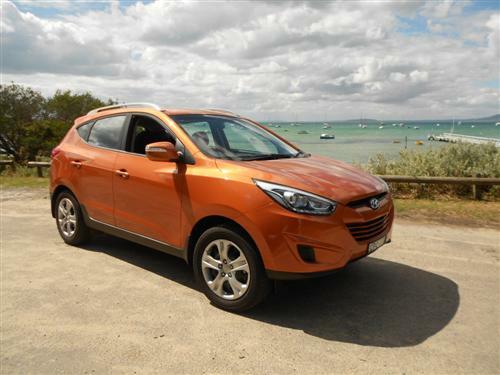 So the choice is wide and Hyundai is very competitive with the ix35. Performance is quite good. You won't be left stranded at the traffic lights in this one. The front seats impressed me with the standard of comfort. 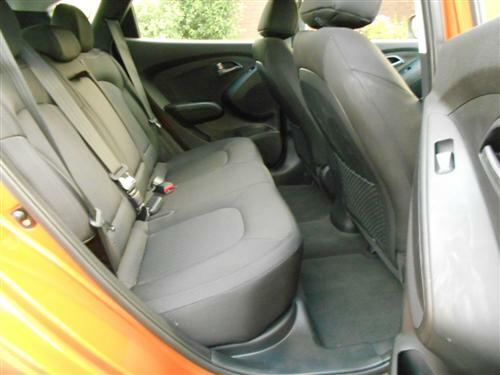 This is a base model car yet the comfy seating has side bolsters that were just right for the average sized adult. Good work, Hyundai. 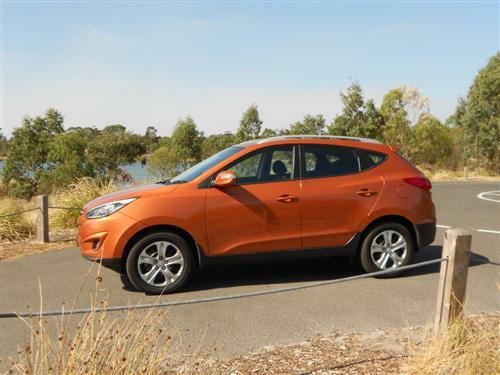 The ix35 Active test car came with a 2-litre 4-cylinder petrol-fuelled engine that drives the front wheels through a six-speed automatic transmission. Maximum power is 122kW at 6,200rpm and maximum torque is 205Nm at 4,000rpm. Rack and pinion power assisted steering is standard. Disc brakes are standard, front and rear. Seventeen-inch steel wheels with nice looking wheel covers come with the Active. The wheel covers may look like alloys when you stand away from the car but don't be fooled as they are not alloys. The spare wheel is 'full-size'. Suspension is by Macpherson struts up the front and a multi-link system at the rear. The factory indicate the fuel consumption rating is 8.4 litres per 100 kilometres on the combined cycle. City drivers may be more interested in the urban cycle which has a rating of 11.2 litres per 100 kilometres. The car's trip computer indicated the Next Car team managed to average 9.8 litres per 100 kms during our time with the car. We only covered 288 kilometres but it did include one 'run' out of town. So our fuel consumption figure seems quite satisfactory to me. Of course SUVs use more fuel than a sedan so there is a trade-off when you choose such a vehicle. The fuel tank capacity is 58 litres. Standard: MP3/CD player with AM/FM tuner with a 5" touch screen; USB audio input with iPod compatibility; AUX jack; Bluettoth telephone and audio streaming with compatible devices; steering wheel mounted audio controls. Standard: six airbags; electronic stability control (ESC) with traction control system (TCS); anti-skid braking system (ABS) with electronic brakeforce distribution (EBD); vehicle stability management (VSM); downhill brake control (DBC); Hillstart Assist Control (HAC) and more. Parking sensors are fitted at the rear. However, a reversing camera is not included and it is this very piece of equipment that is a benefit to one sector of the target market for the ix35 - that is folks who reside in apartment complexes with tight parking conditions. An ix35 can haul a braked trailer (and load) up to 1,600kg. An unbraked trailer up to 750kg is OK. Appropriate towing equipment is required. The tow ball download should not exceed 120kg. These figures reveal off-roading needs to be restricted to easy off-roading tasks with due consideration given to the ground clearance together with the traction requirements in slippery and/or slopey terrain. All new Hyundai cars have a five-year warranty with unlimited kilometres (conditions apply). Capped price servicing applies for the first three years, currently $259 (conditions apply). 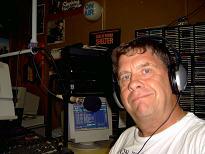 The services are due at 15,000, 30,000 and 45,000 kilometres. 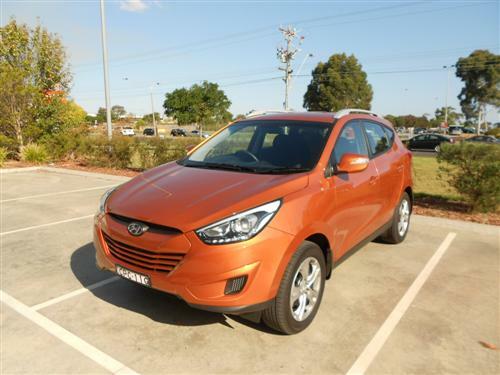 Roadside assistance is included for the first year and this arrangement can be renewed by having the scheduled servicing undertaken by a Hyundai dealer (conditions apply). This is a neat package. 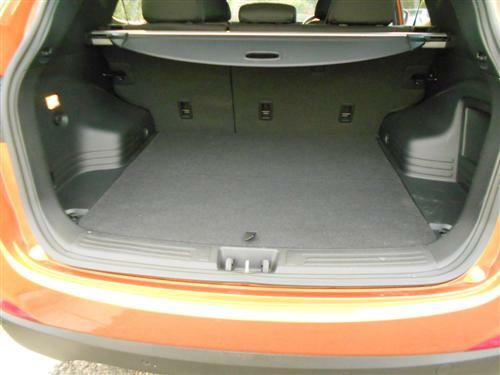 Small, but not cramped, comfortable, easily managed and pleasing with its driving manners. Little wonder that it is the vehicle of choice for so many motorists.